The point of writing is to communicate. So the reason to study ESL writing is to be able to communicate better in English. You have ideas that are worth sharing. Take a little time to learn how to share them clearly. Many of the principles of good writing are the same in any language. However, to make your point as understandable as possible, you need to know the way English speakers organize and present their ideas in writing. If you are not comfortable with it, quickly review English grammar, including English sentence structure, compound sentences, complex sentences, and the structures that are different in your first language. (Tense formation? Subject-verb agreement?Phrasal verb use -which ‘prepositions’ need to follow certain verbs)? 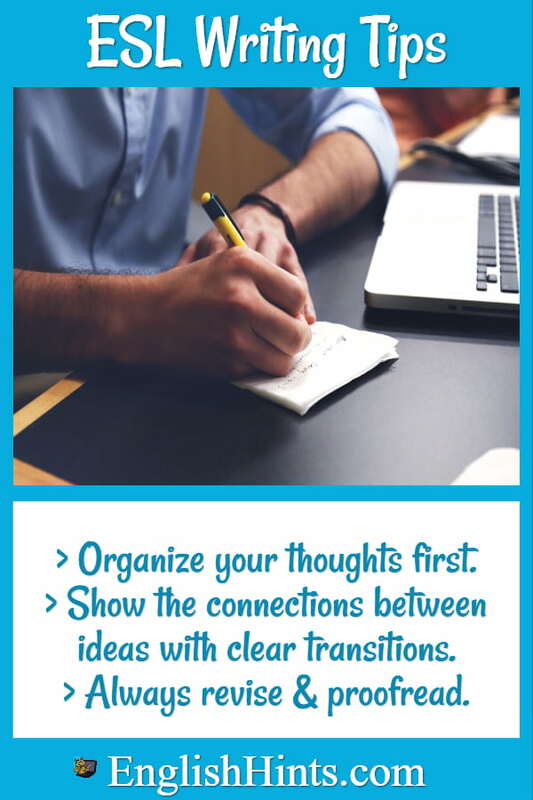 Learn how to show the connections between your thoughts and make clear transitions from one to the next. You might want to practice transition words, and study some of the less familiar transition and linking words used in academic writing. Allow extra time when you need to write in English. It will get easier as you use English more. Until then, reduce stress by leaving plenty of time whenever possible. Often it is easier to write a first draft quickly, putting your most important ideas on paper, and then going back to arrange and polish them and make them easy for others to understand. That revising or editing is important. > Are your main ideas presented clearly? > Have you provided evidence to support them? > Consider the organization of your thoughts, transitions between ideas, and word choice. What changes could make your writing clearer and easier to read? Always proofread. It’s important to proofread anything you write for others, even a quick email or memo. Checking over what you have written helps you find spelling, punctuation, and grammar errors that are easy to miss as you write. See the Revision and Proofreading Checklist. (The last section on Compound & Complex Sentences is optional, but should help if you have problems with sentence fragments, run-ons, or commas.) The Purdue OWL also has an excellent summary of common errors to check for when you proofread. You can also check your proofreading (and other essay skills including summarizing) on the Proofreading Practice page. Writing has some disadvantages compared to speech. People cannot watch your facial expressions and gestures or hear your tone of voice, word stress or speech rhythms. Those visual and auditory clues communicate more than the actual words and word order in spoken language. Besides that, when you speak your hearers can ask questions or make comments if something is unclear. Their feedback lets you know how well they understand your message. If they misunderstand part of it or react unfavorably, you can explain a little more to help them get your point. However, writing also has some advantages. A writer has time to organize his or her thoughts and to revise or even rewrite them in order to express them more clearly than would be possible in normal conversation. In addition, your readers have time to absorb what you say. They can look up unfamiliar words or re-read if they didn’t understand at first. Good writing tries to make full use of these advantages and minimize the disadvantages. Think about what you want to say and the questions your readers may have. Then express your thoughts clearly, in an order that is easy to follow from point to point. Use good punctuation to indicate some of the pauses (commas) and full stops (periods) of speech. This infographic illustrates the power of good writing to help your readers share your experiences. Reading good descriptions actually activates the visual (or other sense) centers of the brain, and motion verbs activate the motor cortex. So choose your words carefully. What you write may influence a reader’s life more than you expect! Some special rules apply to academic writing. It is more formal and precise, and there are special rules for showing the sources of your information and for avoiding plagiarism. Essay Organization discusses types of essays and the sections that should be included in every essay. 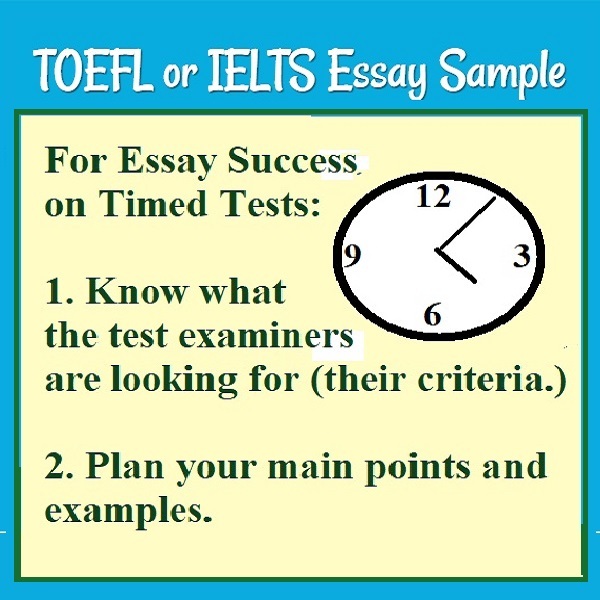 For examples of essay planning and writing, see A TOEFL or IELTS Essay Example. To learn more about English essay requirements and practice writing them, see English Essay Writing Practice. For many kinds of writing help, check out Writing Help Central, especially their pages on transitions, the proper use of prepositions (especially in collocations and phrasal verbs), and troublesome homonyms. You might also be interested in the Virtual Writing Tutor. It is a free grammar checker that specializes in providing feedback to ESL writers on their errors. 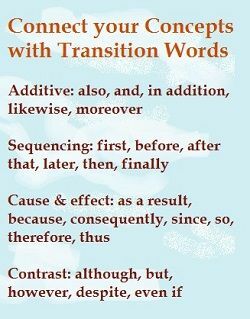 Examples of the main types of transition words, along with a sample essay with gaps to practice using some common transition words like also, although, because, and but.